This show-stopping journey transports you from Tromsø in Northern Norway, across the frozen tundra and mountain plateaus to Narvik, where you board The Arctic Train to Kiruna in Sweden. The tour ends with a spectacular stay at the ICEHOTEL. This flexible trip is in the heart of the aurora zone and allows you ample time to add Arctic excursions such as a Northern Lights hunt or husky, snowmobile and reindeer safaris. You can also extend your stay in any of the destinations featured. Officially, the best time to go in search of the Aurora is between November and March, however, the Northern Lights can actually be seen from as early as September. In fact, Autumn can be a great time to see them without any reflection from the snow. This show-stopping journey transports you from Tromsø in Northern Norway, across the vast tundra and mountain plateaus to Narvik, where you board The Arctic Train to Kiruna in Sweden. The tour ends with a spectacular stay at the ICEHOTEL, which is now open 365 days of the year. Experience the Midnight Sun phenomena and wonders of 24-hour daylight, extraordinary summer scenery, whilst staying in the ultimate winter accommodation! Welcome in the New Year far from the madding crowds at the stylish Malangen Resort near Tromsø, Northern Norway. There is no compromise on quality at this impressive Aurora escape and plenty of activities on hand should you wish to explore the striking Arctic surrounds. Welcome in the New Year at Camp Ripan, where the magic is not confined to New Year’s Eve. There is a whole host of Lapland adventures to enjoy including husky, snowmobile and snow shoe safaris. Relax in the Aurora Spa, dine at the ICEHOTEL and enjoy a sumptuous New Year’s Eve banquet. The cosy accommodation is in a spectacular setting, a stone’s throw from Abisko National Park. This is an Aurora hot spot where it is not just firework’s that can light up the Arctic sky. Call for your tailor-made quote. Witness the extraordinary phenomena of the ‘Northern Lights’ from Tromsø – the self-styled ‘capital of the Arctic’. It may be one of Europe’s smallest capitals, but it certainly puts many others to shame with its diversity of attractions. In close proximity are geysers, caves, hot springs and glaciers. The city centre proffers galleries, museums and sculptures which reflect the huge variety and creative and cultural background of Iceland’s population of just 321,000. Buildings owe more to nature than to architects. Tromsø has established itself at the ‘Capital of the Northern Lights’ during the winter period, but during the summer you have the opportunity to witness the extraordinary phenomena of the Midnight Sun. The sun never sets between 20 May and 22 July and barely dips below the horizon between May and August, enabling you to enjoy endless days experiencing the surrounding nature and fun activities in the world’s most northerly university town. Norway has some of Europe’s most spectacular scenery with fjords, mountains, glaciers and waterfalls, which all present a wonderful opportunity for an exciting and active short break. Bergen and the surrounds are bursting at the seams with outdoor activities including biking, hiking, fjord safaris, scenic rail journey’s and even white-water rafting. 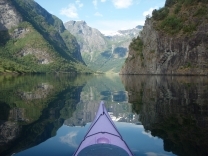 This fjord adventure is particularly suited to families with teens or thrill-seeking friends wishing to explore Mother Nature’s playground using Bergen as your base. Sognefjord, is the longest and deepest of all the fjords in Norway. Extending over 200km inland, the region boasts the UNESCO World Heritage sites of the Naerøyfjord with mountains that tower 1300m above sea level and Jostedal National Park, where arms of the Jostedalsbreen Glacier spill down the mountain sides. Stave churches sit amongst simply breath-taking scenery and lush green valley’s produce some exquisite fare for you to sample. This flexible fly-drive enables you to explore the ‘King of the Fjords’. Follow the route of Kings and Czars along the Baltic Hansa Trail from Stockholm through the Åland Islands to Turku, the ancient capital of Finland, ending in Helsinki the ‘Daughter of the Baltic’. Highlights include sailing through the almost continuous archipelago that stretches from Stockholm to Turku and an overnight stay in Mariehamn, capital of the Åland islands. With Stockholm and Helsinki added to the mix, you can be assured of discovering some of the Baltic’s most extraordinary treasures. The Røros Railway first opened to the public in 1877 connecting Oslo in the South of Norway with Trondheim in the North. The 383 km track passes through some of Norway’s most picturesque landscapes and links centuries of history. This is a cultural journey that can be enjoyed year-round and winter casts a magical spell over the capital Oslo, the UNESCO World Heritage Town of Røros (inspiration for the Disney film ‘Frozen’) as well as Trondheim, the celebrated capital of the Vikings. Europe’s highest railway, the Bergensbahnen, links Oslo and Bergen, climbing to 4000 feet across a barren snowclad Hardangervidda mountain plateau and descends through steep valleys, mirrored in the fjords below. This has been designated as one of the great railway journeys of the world and is just as dramatic in the winter months. A stop off in the fjordside village of Flåm, at this time devoid of the summer crowds, reveals a sleepy hamlet of a bygone era. Experience the extraordinary, unique and glittering ICEHOTEL in the heart of Swedish Lapland. Each year the surrounding snow and ice morphs into a fully serviced snow hotel. World famous sculptors transform huge blocks of ice into dramatic art, which then adorns the hotel and its rooms. Enjoy traditional Sami cuisine, a celebratory drink at the ICEBAR at ICEHOTEL, as well as a plethora of activities. Snowmobile, reindeer and huskies are on hand for Arctic safaris. Play on and around the foothills of one of Finland’s most picturesque fjells, surrounded by the dense pine of the Syöte National Park, marked in winter with snow sculptures clinging to the trees in elaborate formations. Iso-Syöte’s unique position on the southern borders of Lapland makes it the ideal ‘ski-plus’ destination, where you can mix and match all manner of ski and safari activities. Begin your short break in Bergen where mountain meets fjord in impressive style. This charming and colourful city embraces its surroundings and offers an fascinating array of activities, museums, culture and cuisine. Set sail with Hurtigurten, the Norwegian ferry service that has connected coastal communities for over 120 years. Fly high up into the Arctic Circle to Tromsø and turn your stay into ‘An Arctic Night to Remember’ with two nights in the city and an overnight at Camp Tamok in the Vass valley. Mush huskies, search out Moose trails, ice fish and snowmobile across snow white tundra. Sleep under a canopy of Arctic stars in a “hot spot” known to deliver a better than average sightings of the Aurora. Gotland is one of Sweden’s best kept secrets. Wander the walled UNESCO World Heritage Site of Visby, classified as one of the best preserved medieval Hanseatic towns. See the mysterious Raukars on Fårö, which is also the former home of Ingmar Bergman, the acclaimed Swedish director and writer. Days on Gotland pass in an idyllic haze of soft sandy beaches and pristine nature. Complete your trip with a break in Stockholm. A fast efficient Scandinavian rail network links the three contrasting cities of Copenhagen, Malmö and Stockholm. Let the train take the strain whilst indulging in the café culture of Copenhagen, which boasts world-renowned gastronomy, museums and year round entertainment. Immerse yourself in Malmö, and taking stock of Stockholm, ‘The Capital of Scandinavia’. Witness the extraordinary phenomena of the ‘Northern Lights’ from Tromsø – the self-styled ‘capital of the Arctic’. Situated in the heart of the Aurora Zone this destination offers city comforts and plenty of wilderness excursions. The Bergensbanen is one of the great rail journeys of the world: Europe’s highest railway line climbs up to 4000 feet across the barren, snow flecked Hardangervidda mountain plateau before descending through lush valleys to the coast. You can enjoy it in a single day, stop off in the mountains or take the Flåm mountain spur down to the Sognefjord. By day soak up South Iceland’s unique cocktail of sights; the falling water curtains that are the Skógafoss and Seljalandsfoss waterfalls, the foam pounding on Dryrholaey’s black sand beaches and Jökulsárlón Glacier Lagoon. By night fine dine, soak in a hot tub under the starlit sky, and perhaps the Northern Lights, whilst enjoying the countryside charms of the Hotel Ranga.